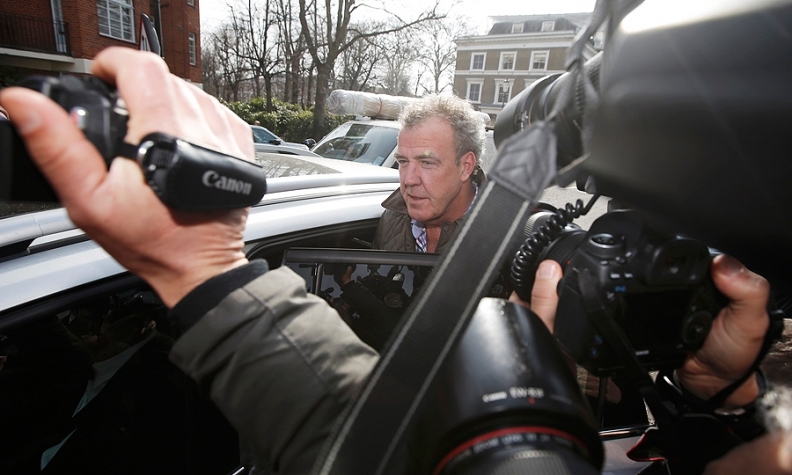 British media reported that Clarkson had thrown a punch at a producer following an argument about food. LONDON (Reuters) -- Nearly 450,000 fans from around the world have backed a petition calling for British host Jeremy Clarkson to be reinstated to his job hosting the "Top Gear" motoring show after the BBC suspended him following a "fracas" with a producer. Clarkson, renowned for his outspoken remarks and acerbic attitude towards "political correctness," was suspended by the BBC on Tuesday, with media reporting that he had thrown a punch at a producer following a row about food. "I'm off the to the job center," the 54-year-old presenter told reporters today before getting into a car outside his home in west London. The suspension has set social media abuzz. The hashtags #BringBackClarkson and #fracas, plus “Top Gear,” were top 10 trending topics in the U.K. on Twitter today. Clarkson, a friend of Prime Minister David Cameron, was already on a final warning over accusations last year that he had used racist language while filming the show, the latest in a long line of incidents which had courted criticism. "He's been involved in a bit of a dust-up but I don't think it's that serious," co-host James May told BBC TV. "Top Gear," aired in more than 200 countries and estimated to have a global audience of some 350 million, has become one of the BBC's most successful and lucrative programs. In an official statement, the BBC said the show would not be aired this Sunday and the corporation's news website said it was unlikely the other two remaining episodes would be transmitted. The Guardian newspaper said that could leave the BBC's commercial arm, BBC Worldwide, facing a multi-million pound bill from foreign broadcasters for failing to deliver the episodes on time. Meanwhile an online petition demanding the BBC reinstate Clarkson had attracted 442,610 supporters from all around the globe by this Wednesday afternoon. "The BBC will become irrelevant very quickly in the USA without Top Gear; be careful," wrote one signatory Fred Bertsch from Denver, Colo.
"Jeremy Clarkson ist Top Gear!!!!" said Austrian Karl-Johann Reitmaier. Clarkson became the popular face of Top Gear by mixing a passion for cars with blunt banter and swagger that has offended groups ranging from mental health charities and cyclists to Mexico's London ambassador. The presenter and his employers have been forced to apologize on a number of occasions. He wrote in his Sun newspaper column in May that he had been told by the BBC that if he made "one more offensive remark, anywhere at any time, I will be sacked."